There is a freedom involved with driving a motor vehicle. You can go wherever you want, go the speed you'd like, listen to whatever music you want; you are in control. While road laws are in place to limit some of that freedom, for a good reason, there is one place where speed is king: the racetrack. While you may not be able to drive a race car yet, BraunAbility and The Sam Schmidt Paralysis Foundation (SSPF) have partnered to bring you a "Day at the Races." A "Day at the Races" is an initiative to bring those on wheels to the tracks in VIP style and luxury. BraunAbility andSSPFcollaborate with local rehabilitation centers and organizations for the disabled, including VA hospitals and veterans associations, inviting patients and members to attend a behind-the-scenes guided tour of the garage and pit areas, enjoy an opportunity to meet the drivers, and passes to view qualifications and actual races. Also included is a catered lunch with guest speakers and celebrity appearances. The speakers address many areas of concern such as transition from inpatient rehabilitation to the home, insurance problems, homecare, family and transportation. Great emphasis is placed on employment opportunities, offering ideas for exploration towards a more promising future and inspirational success stories. A mobile resource center containing literature on topics such as adaptive devices, national and local sports programs, accessible transportation, medical research and other beneficial information is available. As a remembrance of the day, participants also receive racing memorabilia, products from participating sponsors, and contact information for attendees to develop new friendships, support and peer mentoring. In many instances the program offers an initial opportunity for patients to leave the rehabilitation hospital and enjoy the first of hopefully many days of activity with their families. It is a chance for the newly injured to get out to a public venue and interact with an environment where they can see how they can navigate normally from their wheelchair. It provides a chance for networking within the newly injured and those who have lived with an injury for a while. It treats Veterans and those living with an injury in the way they deserve to be treated: a VIP, and more importantly, like another race fan. 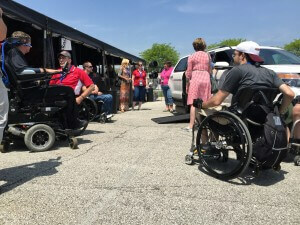 A "Day at the Races" was developed by Sam Schmidt, a paraplegic that is now a race car team owner, to build upon his teams participation at racetracks throughout the country. SSPF solicits support from track owners, drivers and sponsors and one of the goals of the program is to increase the number of participants. The event is hosted at different locations each year, with attendance steadily growing. To find a Day at the Races event near you, check out the Sam Schmidt Paralysis Foundation website. The 2013 season is over, but stay tuned for information about the 2014 season soon!